Personalization is the future of online marketing and advertising. The more you can create an individual experience that’s tailored to each customer, the more you’ll stand out for the superior customer experience you provide. In years past, personalized marketing was a lot tougher, but thanks to big data and data science, it’s getting easier and easier to get to know your customers and to give them what they want before they ask for it. While you’re thinking about personalizing your customer experience, you should consider implementing these easy tips right away to give your customers an instant upgrade. First of all, all too many businesses use their company names as the sender for their emails to customers. Don’t do this. People don’t like talking to companies and corporations – they like talking to people. So, instead of having your company emails come from Company ABC, have them come from a member of your marketing team. Take a look at your data. You can use your data to tell a story about your customers. Using data about location, profession, income, family, etc., you can paint a picture of your ideal customer. The more detailed this picture is, the more you’ll be able to predict this customer’s needs and wants. 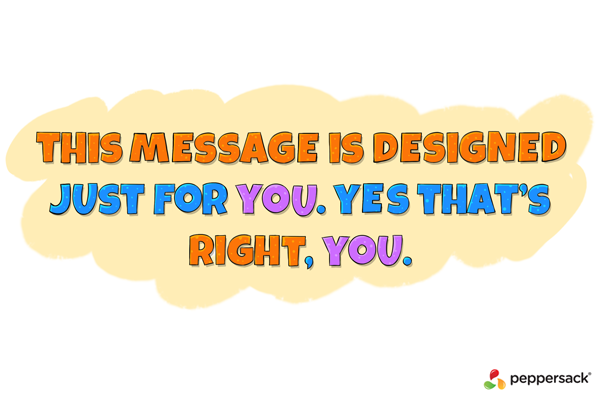 This way, you can send messages and create ads that really speak to the challenges in their lives and how your product or service can help make life easier, more fun, more comfortable, healthier, etc. Along the same lines, look at how your customer data differs. Do people living in a certain area tend to buy more products from you on a regular basis? You can potentially increase your sales even more by doing a localized campaign in that area to bring in more of the people who buy the most from your business. That’s not the only way to segment your messages, either. If you look at your customer data, you may find that you don’t have a single ideal customer group or marketing persona. In fact, your customers may be split up into a few different demographics, areas, etc. Use this information to create better targeted ads and messages for each segment. Finally, while we’re talking about segmenting your customer groups to make better targeted ads and messages, let’s talk about your landing pages. You can further personalize your customers’ experience from the very beginning by creating different landing pages to go with different ads. Instead of having a single landing page for all ads, each landing page should be geared toward the marketing persona that fits its ad. At Peppersack, we’re constantly researching the latest trends in marketing, and we’re always on the lookout for the best ways to improve your lead generation, conversion rate, and customer retention. To learn more about how we can use data science to grow your business, contact us today.